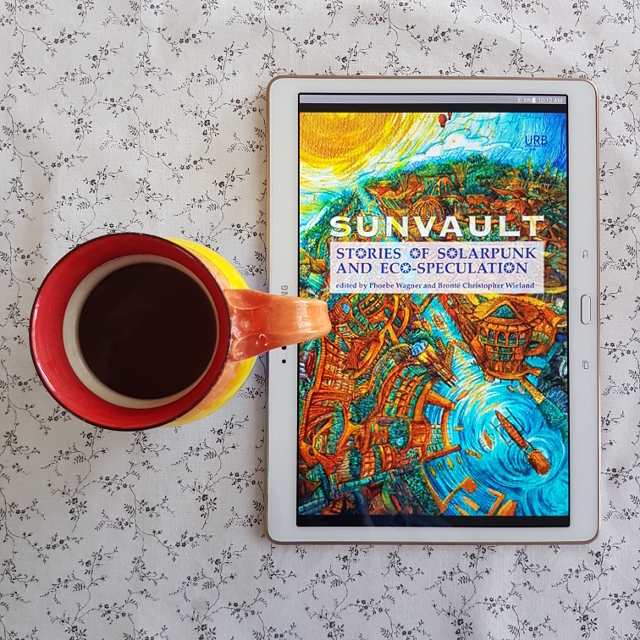 Sunvault: Stories of Solarpunk and Eco-Speculation is the first anthology to broadly collect solarpunk short stories, artwork, and poetry. A new genre for the 21st Century, solarpunk is a revolution against despair. Focusing on solutions to environmental disasters, solarpunk envisions a future of green, sustainable energy used by societies that value inclusiveness, cooperation, and personal freedom. Edited by Phoebe Wagner and Bront Christopher Wieland, Sunvault focuses on the stories of those inhabiting the crucial moments when great change can be made by people with the right tools; stories of people living during tipping points, and the spaces before and after them; and stories of those who fight to effect change and seek solutions to ecological disruption. Contributors include Elgin Award nominee Kristine Ong Muslim, New York Times bestselling author Daniel Jos Older, James Tiptree, Jr. Award winner Nisi Shawl, World Fantasy Award winner Lavie Tidhar, and Lambda Literary Awards finalist A.C. Wise, as well as Jess Barber, Santiago Belluco, Lisa M. Bradley, Chloe N. Clark, Brandon Crilly, Yilun Fan and translator S. Qiouyi Lu, Jaymee Goh, Jos M. Jimenez, Maura Lydon, Camille Meyers, Lev Mirov, joel nathanael, Clara Ng, Sara Norja, Brandon OBrien, Jack Pevyhouse, Bethany Powell, C. Samuel Rees, Iona Sharma, Karyn L. Stecyk, Bogi Takcs, Aleksei Valentn, T.X. Watson, Nick Wood, and Tyler Young. Sunvault is a robust and enjoyable anthology with strong ideas and a large dose of hope. Variety is a key feature of this anthology and one that cropped up in a number of ways. The inclusion of poetry and artwork was a refreshing touch. It was nice to see these forms taken seriously in the anthology’s survey of solarpunk. The works within the anthology come from an impressive range of cultures. There was a Chinese work in translation alongside stories from Jewish and African American creators, among others. There was also work that centred disabled characters in ways sometimes reminiscent of Defying Doomsday. All of this led to a wonderful plethora of visions of the future, as well as variety in the tone of the stories. That said, hope for the future is a key element of solarpunk. There are no stories here that are unremittingly bleak, even if hope remains slim in some–such as C. Samuel Rees’s Terratology. These works tend to celebrate the tenacity of humanity and our ability to come together and find solutions. Naturally, there are stories in this anthology that are primarily focused on ideas, rather than characters and relationships. This is not generally my cup of tea, but I found the ideas interesting enough to keep me reading. Worldbuilding is a strength of most of the works in this collection, with some offering visions of the future that are more practical than others. Throughout, there is a nice balance with works that are more emotive. Some highlights of the anthology for me were Daniel Jose Older’s Dust about a genderfluid protagonist with a special connection to an asteroid hurtling towards the Earth. It deftly blended ideas and character, with a wonderful emphasis on connection to place. Similarly, Lev Mirov’s The Desert, Blooming brought together religion and science in a beautiful combination, as the protagonist leaves the dome under which they have grown up for the first time to help plant trees to reclaim the desert. All in all, Sunvault is an anthology that has been skilfully pieced together and I highly recommend it, particularly for those looking to get an overview of this subgenre.